Luthier Rick Mullen‘s Workshop During A Standard Procedure. 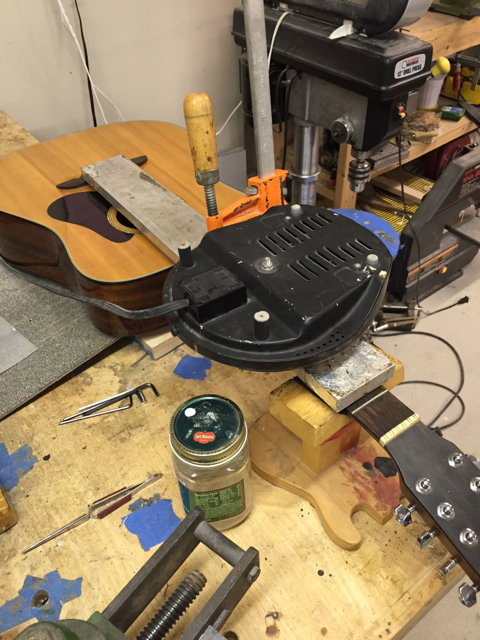 More than just an adjustment, Rick successfully performs a heating a clamping method to cure the warped neck on an Alvarez acoustic 12. Says Rick Mullen, “Sometimes a guitar needs a full neck reset, but sometimes a heating treatment will do the trick.” Rick revived Duncan Sheik‘s Gibson acoustic 6 with the same procedure. After, Duncan claimed the guitar never played so well. I wonder what other guitar ailments Dr. Rick can remedy? hmmmmm….